Garrett Burden was one of Class 2-1A's most prolific passers a year ago for Medicine Lodge when he threw for 1,872 yards and 19 touchdowns. With Medicine Lodge moving down to eight-man football this year and graduation claiming leading receiver Drew Honas, the question was if Burden and the passing attack would translate well. It has. Burden began his senior season by throwing for 302 yards and seven touchdowns in a rout of St. John and he's hardly slowed down since. Burden has amassed 1,649 yards and 28 touchdowns in six games and is coming off a 377-yard, 6-touchdown performance in a win over Udall. Argonia-Attica has been a postseason fixture of late and is capable of lighting things up, scoring 70 last week. If this becomes a shootout, Burden could have a monster night. In a season where the Grizzlies backfield has been decimated by injury, senior Zane Colson has been the one constant. Through five games - not counting a week one forfeit by Blue Valley Randolph - Colson has rushed for 720 yards on 62 carries, an 11.6 yard per carry clip with 11 TDs. Friday against Southern Cloud Colson erupted for 339 yards and five touchdowns and is now over 3,400 yards rushing for his career. Colson also has a kick return touchdown this season and has accounted for 61 total touchdowns for his career. Rock Hills faces Pike Valley in a key 8-Man II, District 4 contest, and Colson will need a big game to keep the Grizzlies in the driver's seat for the district title. Dubbert has helped St. John’s-Tipton to a 4-2 start with a strong start on both sides of the ball. While Dubbert has rushed for more than 620 yards and 11 touchdowns, he also is the Blujays leading tackler. Dubbert (5-8, 170) has registered 91 total tackles from his linebacker position, including 53 solo stops and 38 assists. That works out to approximately 15 stops per game. The Blujays already have four wins and have clinched a spot in the 8-Man, Division II bracket, but a win this week against Lakeside-Downs would set up a district championship game with Mankato-Rock Hills next week. Hoover has been one of the top big playmakers in the state this year for unbeaten McPherson. The senior wideout has caught two touchdowns in each of the Bullpups’ last three games, and has gone over 100+ receiving yards in four of the six games played thus far. Look for him to have another big week against winless Rose Hill. This Bullpups offense is high-flying and will be hard to stop. Hoover probably will only play one half, but he will put up some video game numbers in that time. The 5-1 Indians have fallen out of the state rankings with a 64-30 loss to undefeated St. Francis in Week 5, but remain a strong state contender in highly competitive Eight-Man, Division I. While Hoxie has had allowed 20.3 points per contest, the offense has scored 45 a game. The Indians’ experienced and massive line with seniors Taye Washington, Colton Heskett, Sam Bretz and Jarrod Dible, have allowed the Indians to match last year’s scoring average from a 12-1 team that captured the Division I title. Hoxie has averaged 237 rushing yards a game and 110 passing yards a contest. Senior Jared Kennedy has completed 42 of 68 passes for 662 yards with a 6/6 TD/INT ratio. Junior Wylie Weems has 124 carries for 764 yards in his first year as the starting running back, and Kennedy has contributed 358 rushing yards and 10 scores. Hoxie has averaged 6.97 yards per play after 6.27 yards per play last fall. This week, the Indians’ offensive line looks for another big game on the road against Oberlin (3-3). 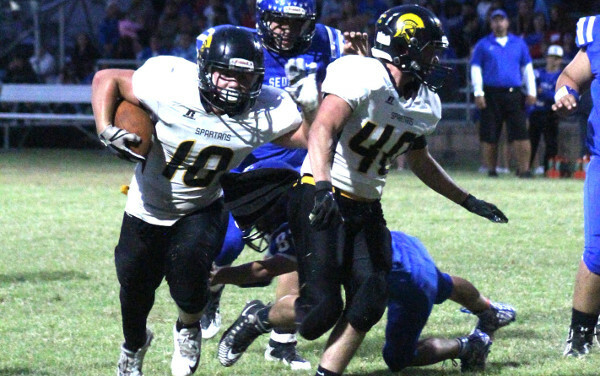 Sophomore running back Brogan Myers has enjoyed a breakout season for the Spartans. Behind a strong offensive line, Myers (5-8, 205) has rushed for 1,175 yards and 25 touchdowns this season. He is averaging 12.1 yards per carry. His combination of power, balance, and speed has allowed him to put up some big performances. None bigger than his 262-yard, 9-touchdown effort in a 64-32 win over district foe Sedan. Myers has also broken the 250-yard mark two other times, including a season high 289 yards with five scores against South Haven, and 279 yards and six touchdowns against Flinthills. Myers and the Spartans sit tied atop the Distirct 1 standings along with Central Burden. While a showdown with the Raiders looms next week, the Spartans will put their record and district-leading points margin on the line against Oswego this week. The Indians likely need at least one more win to secure a spot int the 8-Man, Division I bracket and have been involved in high-scoring games the last three weeks. If this turns into another shootout, look for Myers to have another big night. The Eagles are one of the best rushing offenses in the Kansas City Metro. Two weeks ago, the Olathe North offensive line plowed the road for more than 400 yards rushing in a win over Olathe South. The Eagles get Lawrence this week and it could be another big night for the Olathe North offense. Schremmer is the Panthers' top receiving option so far this season with 707 yards and nine touchdowns. Senior quarterback Koy Brack has done an excellent job orchestrating the Great Bend offense that frankly hasn't gotten enough praise having scored 35 on Andover, 34 on Wichita Northwest and 33 on Bishop Carroll. This week, the Panthers go to Liberal - a team whose only win came against a winless opponent. Schremmer has the potential to pad some stats and help Great Bend stay hot in 2018.